» Will Hwy. 20 issues ever be solved? Will Hwy. 20 issues ever be solved? 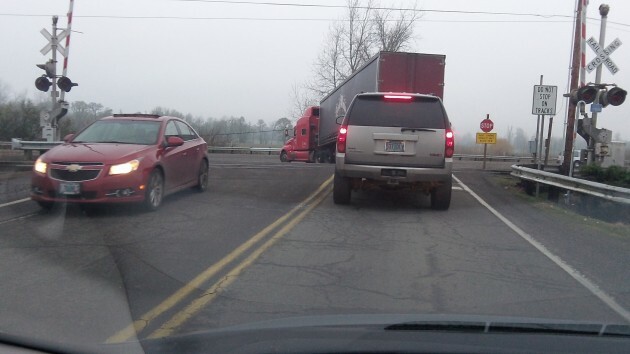 A truck driver waits to turn left toward Albany on Highway 20 from Independence Road. “We ought to do something about Highway 20.” I’ve heard words to that effect for more than 30 years. But nothing significant has been done. We’re talking about the Albany-Corvallis Highway here, the two-lane segment that runs between the two cities for a little more than 10 miles. It carries an estimated average daily traffic of up to 15,000 vehicles, according to a table ODOT compiled in 2014. That would be fine, except that most of those vehicles are on the roads during a couple of hours in the morning and afternoon. Stop-and-go traffic getting into Albany after work is almost routine. 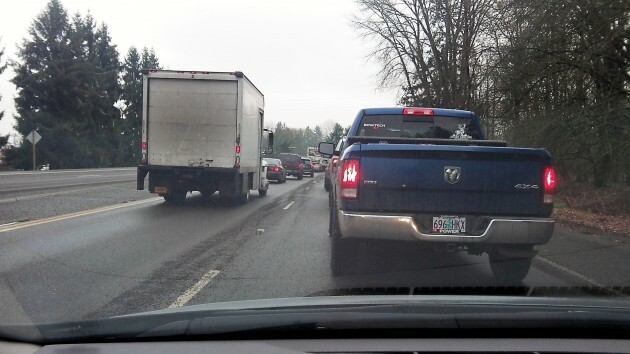 Stop-and-go traffic waiting to get into Albany on the Albany-Corvallis HIGHWAY. Other issues: The curves and narrow shoulders west of Juniper Lane. The need by residents of side streets near Albany and Corvallis to make left turns to get home, thus stalling long queues of traffic behind them. The super-elevation on the approach to the Ellsworth Street Bridge, a feature that kept ODOT from allowing permanent double left-turn lanes from North Albany Road. And then there’s this added cause of congestion: The right-hand lane carrying traffic into Albany from the bridge often has to stop even when it has a green light because some pedestrian is strolling in the First Avenue crosswalk, keeping anyone from making a right turn. A few years ago ODOT commissioned a safety study on part of the highway. Now another study is in the works. But every time the subject comes up, the word is that there’s no money for widening the highway or other big projects. There is money for plans, though. The Albany Metropolitan Planning Organization is gearing up for making another one, the Albany Regional Transportation Plan. For that there’s a process, of course, even though Albany and every other jurisdiction already has a transportation plan. Another study that will cost how much? Seems to me that it is a waste of resources to do a study that has had no money in the past and none in the foreseeable future to solve (?) a problem that has existed and does exist. The problems that are present now will undoubtedly not be the same as those we will see in another 5 to 10 years. More noise, no possible action at this time. It will need to be on the ODOT long-range planning “map.” If the MPO can help hep keep that on their radar screen, eventually it will rise in priority to the point of funding. I have to say that Highway 20 is unchanged since at least the 50’s so I wouldn’t hold my breath that ODOT, the bureaucracy king of Oregon, will ever spend a dime because they need the money to pay their 5000 employees.